Re-brand The North Face. Wow. This was a dream assignment. The North Face was facing stiff competition from emerging brands in a rapidly growing category and needed to secure their position as the industry leader while appealing to a broader audience. My new positioning – Never Stop Exploring. The line re-energized the brand, aligning all the marketing into a cohesive and inspiring brand narrative that is inclusive while supporting The North Face premiere mountaineering position. Rewarding to see the line live on for years. First ascents. First descents. To be the ‘first’ is the ultimate trophy for outdoor adventurers. 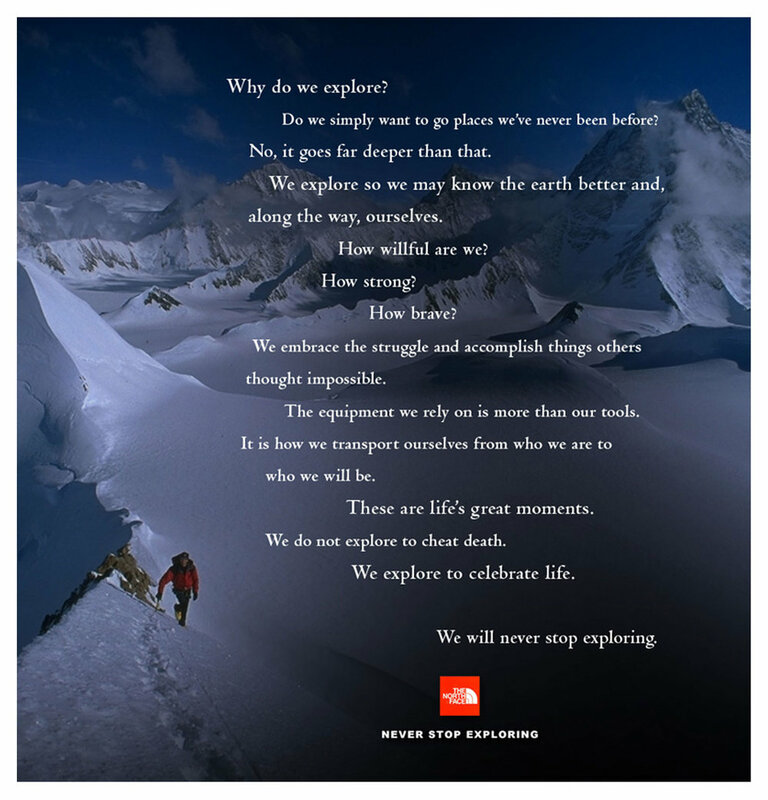 ‘The North Face Expeditions’ is a five-part TV series, hosted by Sting, that follows The North Face's premier outdoor adventurers as they explore the farthest reaches of our planet. The series followed five historic expeditions giving viewers an inside look at the passion, the determination, and the risk that it takes to achieve the ultimate mountaineering and adventure prize. The series aired over 5 Sundays as a presentation of NBC Sports programing. The faces of adventure. The North Face athlete team is an elite group of outdoor explorers that few know. 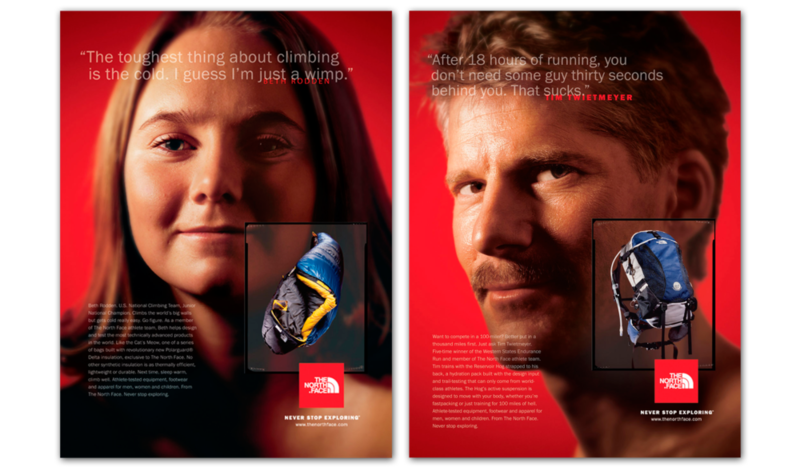 We created a print campaign that introduced these athletes to a broader audience. Using assets from the 'TNF Expeditions' TV series we created a series of ads that explored what motivates these unique adventurers to go farther then they have before. The North Face bulit its reputation on innovation and extreme testing conditions for their products. We created a variety of product marketing campaigns and programs, for both consumers and retailers. Gear up, and go explore.